We have only one quibble with this crazy easy chocolate fudge recipe. Although the author mentions in the cookbook that this is “certainly not your grandma’s classic chocolate fudge,” we find that to be not exactly true. 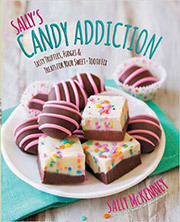 The author, of course, who couldn’t be lovelier or more creative (have you tried her chocolate-dipped potato chips?! ), is referring to the classic turn-of-the-20th-century fudge that needed to be beaten within an inch of its life. This recipe is not that. But this recipe is the very same easy chocolate fudge recipe making the rounds in spiral-bound church cookbooks in the Midwest and, we suspect, elsewhere for literally decades. It’s the fudge that our editor in chief recalls from childhood and the one that the grandma in her family still makes. Whether the recipe has remained in circulation so long because it’s so darn good or because it’s so shamefully easy to make isn’t clear. We suspect it’s probably due to both. This easy chocolate fudge recipe was a hit. Not only is it easy to make, but everyone who tried it liked it. I’ve made fudge the traditional way, and the difference in the results might be in terms of lightness—this was a very heavy fudge-like frosting with nuts (which isn't a bad thing). It was so easy to make this shortcut chocolate fudge that I definitely would make it again when I need something fast. I could also see switching out the type of chocolate, nuts, etc. I'd also say that a little more vanilla might be good. I made this for my fudge-loving mother-in-law over the Canadian Thanksgiving long weekend. It was easy to prepare and turned out "just like real fudge," which I have to say, I was surprised at, given the ingredient list. I'd suggest cutting the fudge as soon as you can (+/- 4 hours) and then refrigerating it so it's easy to handle. The fudge is very rich, so I cut it into 1-centimeter cubes, which was plenty (plus, you can have a few because they're so small!). I didn't use nuts—my MIL doesn't "do" nuts—and the consistency was just fine. I imagine any stir-in ingredients would be great—nuts or maybe even candy canes for the holidays? Make sure the condensed milk goes in the pan first so that the heat is hitting that rather than the chocolate chips first. Even if you stir constantly, it's pretty thick at the start, so some chips might burn. Definitely the easiest chocolate fudge recipe ever. And it's delicious. Timing is exactly right. You can't cut it directly out of the fridge. Wait at least 30 minutes. I made 64 squares. They're small, but who needs a big piece of fudge? One tweak: I toasted the walnuts. I would definitely give this for holiday gifts. You could buy small boxes like the ones they have at candy stores and put the fudge in those. This no-fail recipe is just that—it just couldn't be any easier. Whether you're a beginner or very experienced cook, this easy chocolate fudge recipe is a winner. The time it took to melt the chips along with the sweetened condensed milk was about 15 minutes on medium-low heat. Lining the pan in foil made cleanup a breeze. A big time-saver. Setting the fudge on the counter maybe isn't recommended—waaaayyyy too much of a temptation. So refrigerating is the way to go. It's a softer, melt-in-your-mouth consistency. Letting it set overnight can NOT be done. No one has to know you spent all of 20 minutes tops on this recipe and that it only required 4 (3 if you skip the nuts) ingredients. Easy Chocolate Fudge Recipe © 2015 Sally McKenney. Photo © 2015 Sally McKenney. All rights reserved. All recipes and photos used with permission of the publisher. This looks and sounds wonderful ..
Do you think I could melt chocolate and condensed milk in micro slowly while stirring every 30 seconds .. I find this method of melting chocolate much easier and less of a risk ..
Hi Esther, it should be fine to melt the chocolate in the microwave. Just be sure to watch that it doesn’t scorch and take it out when the chips begin to melt. Def will make this. Thank you! Thanks for the recipe. Looking around the web for potential add-ins other than walnuts, I see very similar recipes with a curious difference – they call for 1/4 cup of butter – something this recipe excludes. What difference would the addition/subtraction of said quantity of butter make in this recipe? 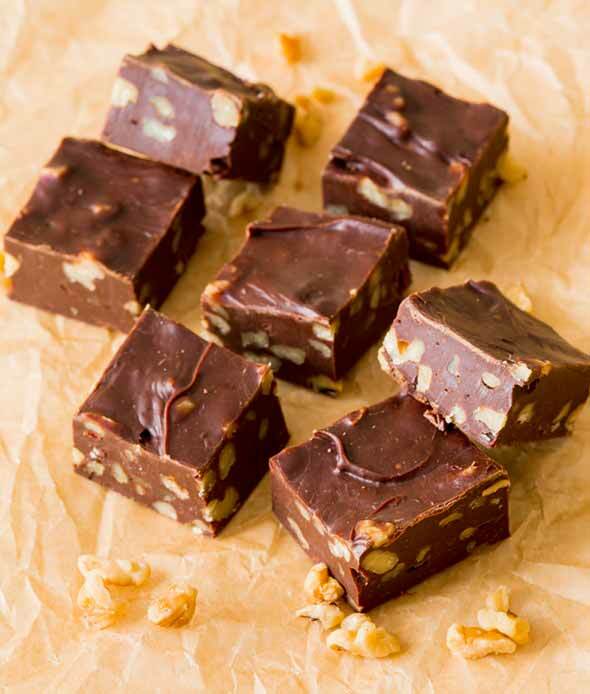 hi EJefferson, this recipe is an easy cheater version of fudge so the sweetened condensed milk takes the place of sugar and butter that are used in other fudge recipes. Nice, Carl! Thanks so much for letting us know.